Major League Bishop: Still here. Still pregnant. Happy Saturday! Well I'm still here and I'm still pregnant. It hasn't been so bad, other than there is so much I want and need to do and I'm not supposed to do it! The rest seems to have done the trick though. Thursday night, I was up almost all night with contractions that were pretty regular. I thought for sure that was it. Then, Friday morning it all just kinda stopped. I have occasional contractions that can be quite bad, but they are few and far between now. So, I rest...I'm getting pretty bored. Abby has been a great companion. She knows something is up and is sticking right by my side. She's cute. And Brian is great. He's busily getting things ready. He's putting together baby stuff, cleaning, running my errands, packed our bags, all the things we thought we had another 3 or so weeks to get done. And it still could be another week or so...or...it could be today! Christmas shopping is pretty much a dream right now. I hope everyone will understand! If I'm home much longer, I suppose I can get some internet shopping done. The doctor did say I can go back to work next week if no baby and no contractions. She did say the only reason she would allow that is because she is "more comfortable" with me going into labor next week. So, we'll see. Another words, as soon as I get moving she thinks I'll have this baby. Hope everyone is well. We'll keep you updated. 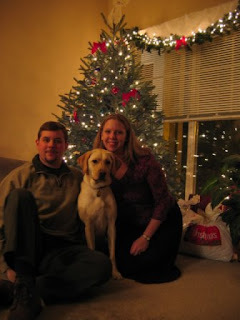 I thought I would add an old Christmas picture of our family so far. Soon, there will be a fourth there!